We work as a cargo booking agency of Nippon Steel & Sumikin Logistics Co.,Ltd.（NSSL) since their predecessor, the former Sumitomo Metal Logistics Service Co., Ltd, established Izumi Shipping Co., Ltd. as their maritime transport department in 1978. Izumi Shipping initially started their regular service between Japan and Taiwan, monthly 3 to 5 voyages from Yokohama, Nagoya, and Osaka. Although the number of ships shrank in the severe circumstances such as the appreciation of the yen and oil shock, they have always played a central role in the Taiwan route. Nittetsu Sumikin Logistics Co., Ltd., integrated and established in 2006, took over its operations and mainly transports Nippon Steel Sumikin's steel products to the Southeast Asian region. Today we are serving as the agency for their regular services from Funabashi and Osaka to Taiwan and Hong Kong, and we are also serving customers' requests while expanding the service area to Thailand, Vietnam and others. We will continue to work with Nittetsu Sumikin Logistics Co., Ltd. to make efforts for the safe transportation. We work as a cargo booking agency for the conventional shippment of Daiko Shipping Co., Ltd since its establishment in 1979 with trust and patronage from the shippers. Daiko Shipping has been operating regular services for monthly 3 to 4 voyages between Japan, Taiwan, and Hong Kong for 40 years since the commencement of the operation. 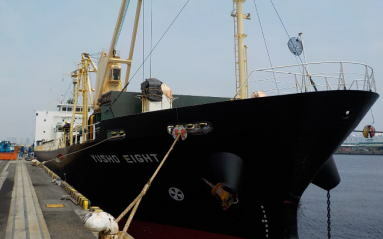 We will continue to work with the headquater of Daiko Shipping in Nagoya to collect cargoes in Yokohama, Nagoya, Kobe, and Osaka and make efforts for its safe transportation.